With Christmas just around the corner, now is the time to start wrapping those holiday gifts. One of the most wasteful parts of the holiday season is the insane amounts of <a href="http://www.inhabitots.com/the-wrap-up-on-holiday-wrapping-paper/">wrapping, ribbons and bows</a> that are used for one day - then tossed into the trash. Since most of these gift adornments aren't reusable or recyclable, thinking eco-friendly is essential! Instead of hitting the big box stores for holiday wrapping, ribbon and bows - go the recycled route. 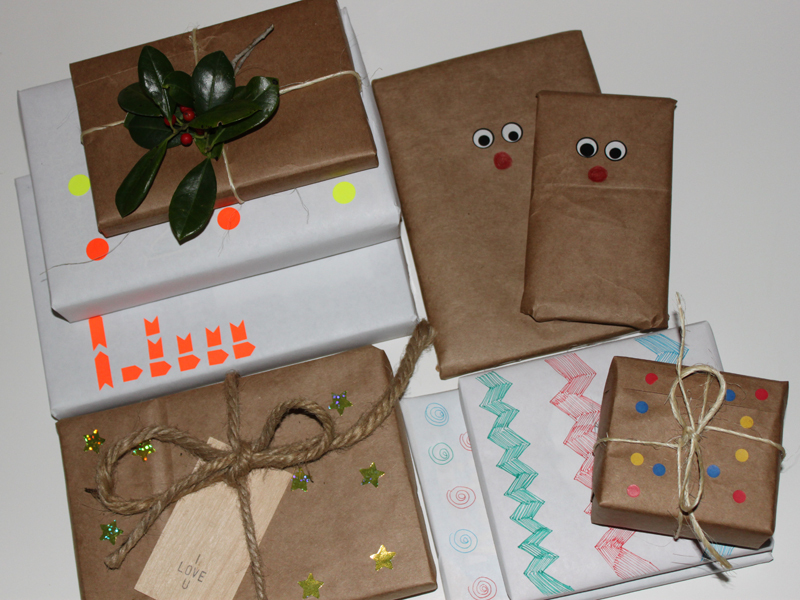 There are many recycled items that you can find inside your own home to wrap gifts! These items aren't only given a second life as <a href="http://www.inhabitots.com/how-to-make-recycled-holiday-gift-wrap-and-tags/">beautiful wrapping for your presents</a>, but when you are finished with them, you can reuse some of them and toss the rest into the recycling bin. I spent a few minutes scouring my recycling bin, craft closet and office desk and found more than enough items to wrap my holiday gifts this year. 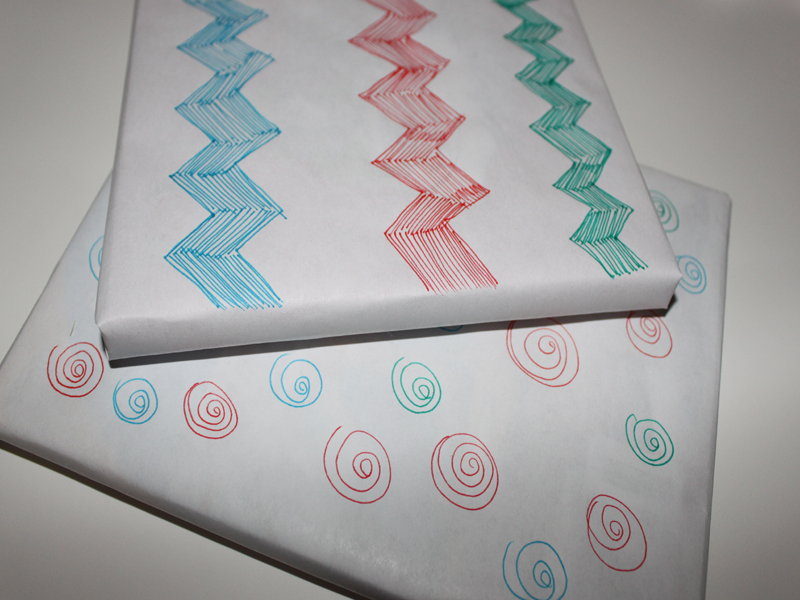 Read on to see six of my simple, eco-friendly DIY holiday gift wrapping ideas and start wrapping! 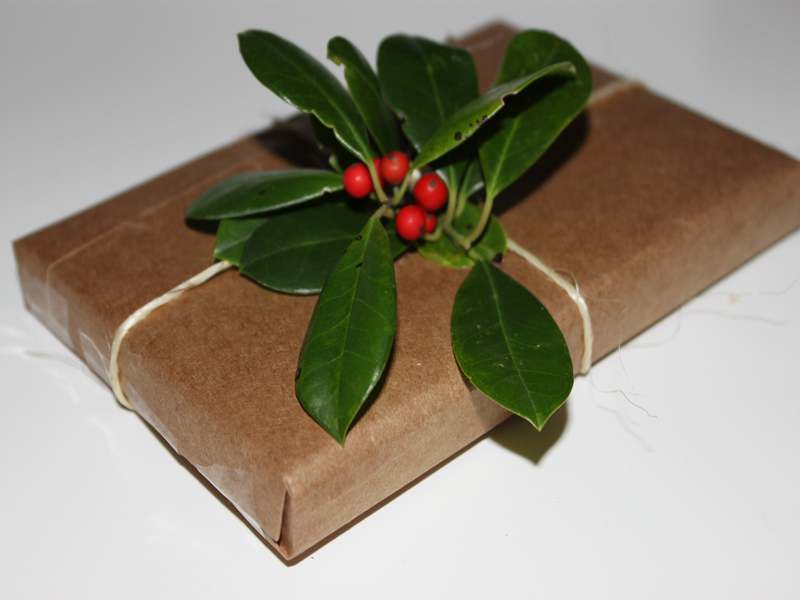 <h2>Eco Gift Wrapping #1</h2> Wrap the gift in recycled brown kraft paper or a brown paper bag. Tie in twine and adorn with a fresh sprig of greenery from your yard! 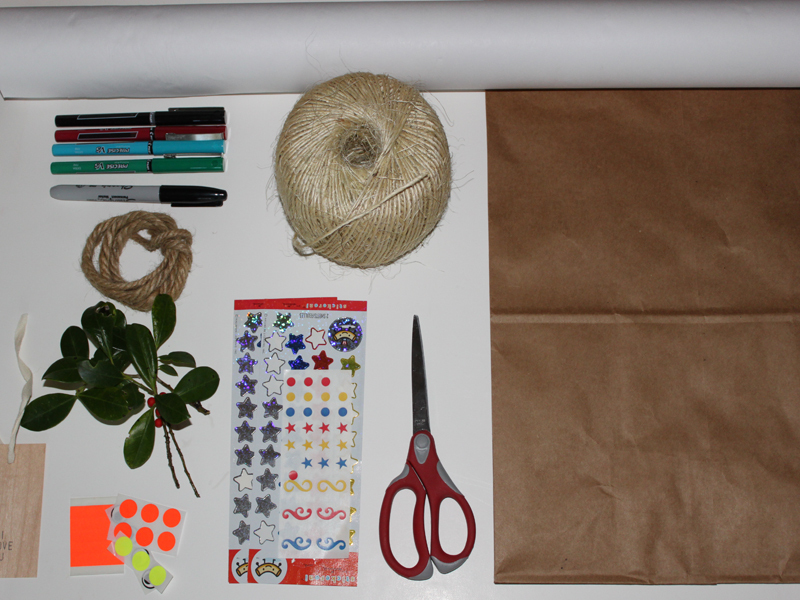 <h2>Eco Gift Wrapping #2</h2> Wrap the gift in recycled brown kraft paper or a brown paper bag. Tie in twine and adorn with dot stickers from your craft closet or office supplies. 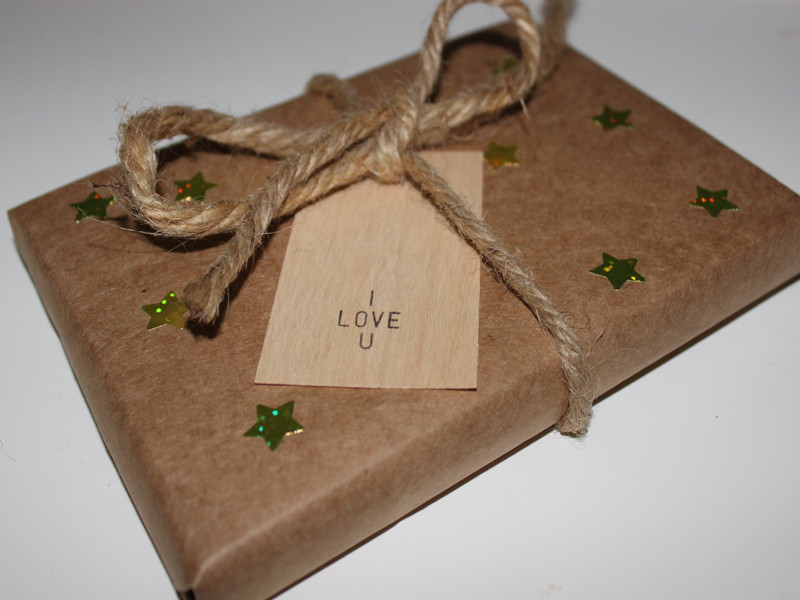 <h2>Eco Gift Wrapping #3</h2> Wrap the gift in recycled brown kraft paper or a brown paper bag. Tie with woven rope into a bow and adore with a wooden gift tag and gold star stickers from your craft closet. 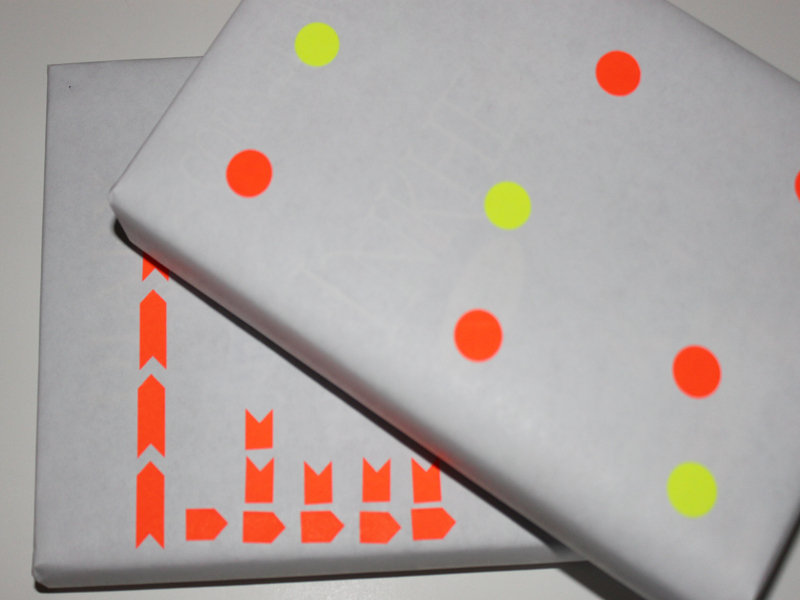 <h2>Eco Gift Wrapping #4</h2> Wrap the gift in recycled white kraft paper and adorn with neon dot or chevron inspired stickers in a funky pattern. <h2>Eco Gift Wrapping #5</h2> Wrap the gift in recycled white kraft paper and use markers to draw chevron or dot inspired designs on the top of the gift. 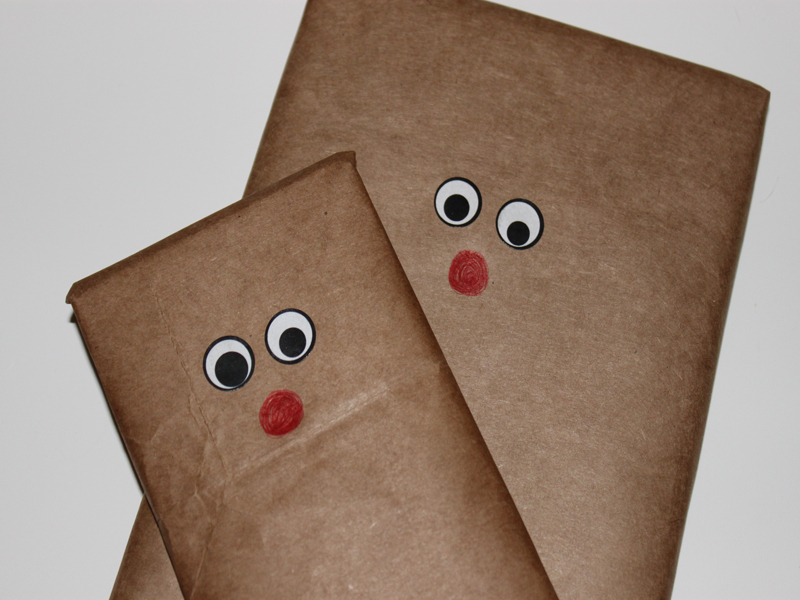 <h2>Eco Gift Wrapping #6</h2> Wrap the gift in recycled brown kraft paper or a brown paper bag. Adorn with either googly eyes or eye stickers and affix a red nose made from marker, a red button or a red pom-pom. With Christmas just around the corner, now is the time to start wrapping those holiday gifts. One of the most wasteful parts of the holiday season is the insane amounts of wrapping, ribbons and bows that are used for one day - then tossed into the trash. Since most of these gift adornments aren't reusable or recyclable, thinking eco-friendly is essential! Instead of hitting the big box stores for holiday wrapping, ribbon and bows - go the recycled route. 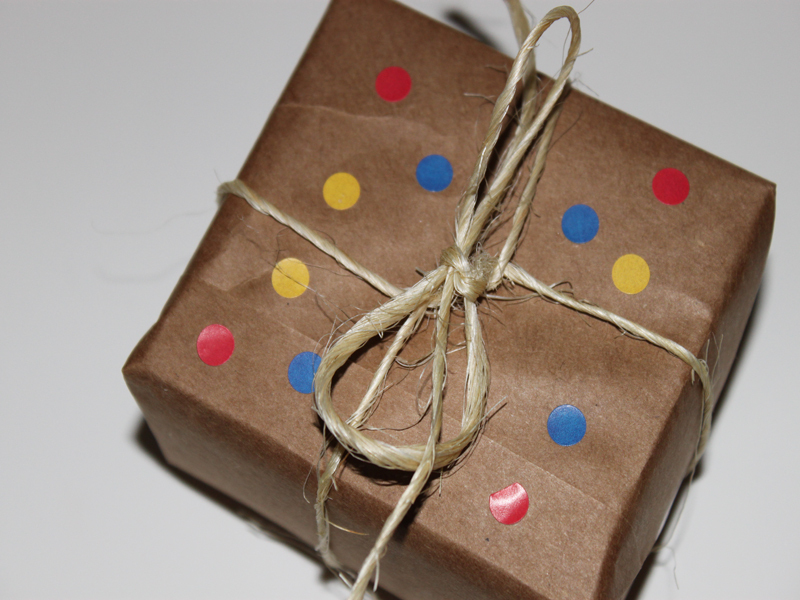 There are many recycled items that you can find inside your own home to wrap gifts! These items aren't only given a second life as beautiful wrapping for your presents, but when you are finished with them, you can reuse some of them and toss the rest into the recycling bin. I spent a few minutes scouring my recycling bin, craft closet and office desk and found more than enough items to wrap my holiday gifts this year. Read on to see six of my simple, eco-friendly DIY holiday gift wrapping ideas and start wrapping!